Learn Spanish on holiday in Spain! The best way to learn a language is to go to the country where it is spoken, talk to real native speakers of the language and immerse yourself in the culture. You will be amazed at how much progress you can make when you have the chance to actually use your language skills in real-life situations. With our tailored Spanish courses in and around Granada you can try out your language skills in the shops and restaurants or stay in an authentic Spanish village and chat to the locals, as well as receiving formal language teaching adapted to your level and needs. Granada is an enchanting city, lying at the foot of the impressive Sierra Nevada mountain range, the highest in Spain. There is so much to do here - sightseeing, culture, walking, skiing, cooking that it is easy to combine language learning with a fun and rewarding holiday, wherever your interests lie. 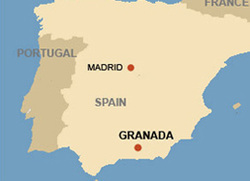 Granada is in the south of Spain, in Andalucía. 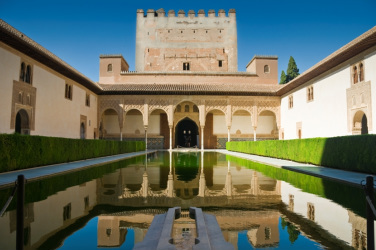 You can fly direct to Granada from some European cities, and Malaga airport is only just over an hour away. The Alpujarras, where we have a wide selection of accommodation, is the area south-east of Granada capital, and this region stretches all the way to the province of Almería. Zagra, where we have another centre, particularly suitable for large groups or several families, is to the west of Granada, just off the route from Malaga airport. Click here to see where all of these places are in Google Maps.